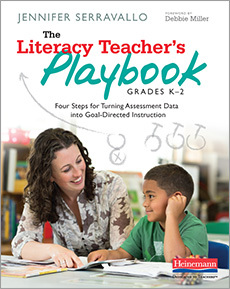 Thank you for your interest in The Literacy Teachers Playbook, Grades K–2. In it, Jennifer Serravallo outlines four steps for assessment that function like a playbook: the indispensable guide a coach relies on to know just what to do in certain situations. In this sampler you will be introduced to her four-step assessment protocol and read about step 2: analyzing data. Jen models how to look closely at each piece of data to determine a students’ strengths and needs—the ideal information for supporting targeted, goal-driven instruction.